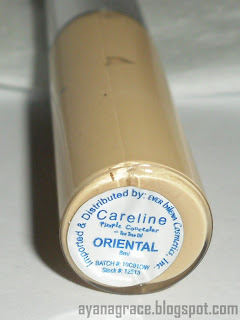 Description (from Careline): Careline introduces a one of a kind pimple concealer. It has tea tree oil that is proven to be effective against pimple. As the tea tree oil infiltrates onto your skin, it can soothe and cleanse creating a blemish-free effect. Ingredients: Water, glycerin, squalene, caprylic/capric triglyceride, 1,3-butylene glycol, dimethicone, stearyl alcohol, PEG-100 hydrogenated castor oil, cyclomethicone, melaleuca alternifolia (tea tree) oil, carbomer, triethanolamine, disodium EDTA, tocopheryl acetate, methyl paraben, propyl paraben, may contain CI 77891, CI 77491, CI 77492, CI 77499. This concealer is available in 5 different shades - Almond, Bisque, Chestnut, Natural and Oriental. I got mine in Oriental, which was the shade recommended for me by the SA. I tested this immediately after buying it. I was a little disappointed with this product at first because it wasn't able to totally conceal the pimple I covered. It did lighten the pimple, though. Then I tried to conceal a lighter, not-so-red blemish. Success. Although this product cannot totally conceal my pimples, it's not a total waste of money since it can lighten my blemishes and conceal light ones. Also, the tea tree oil in it is definitely working as I have observed drying and shrinking of my pimples. I also use it to lighten the undereye area and to conceal the redness around the corners of my nose. Just don't apply it very near the eyes to keep your eyes from watering and being irritated. 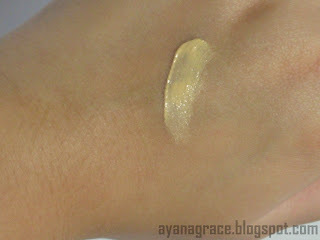 As for the texture and consistency of this liquid concealer, it can be blended smoothly on the face. 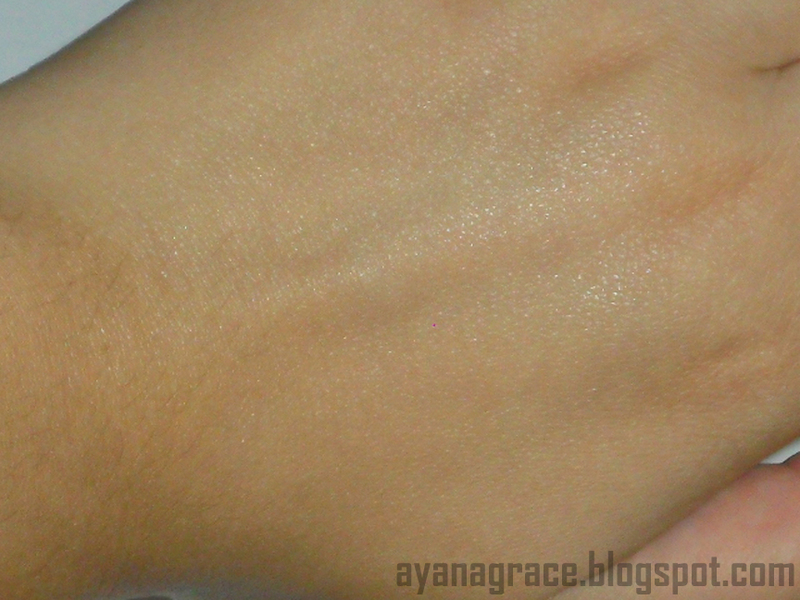 and it doesn't dry too quickly, giving you enough time to pat and blend. 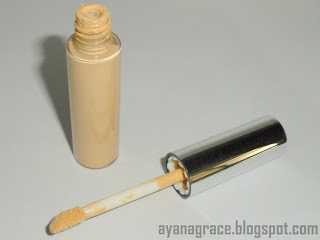 As for the packaging, the concealer is packaged in a clear tube and you can easily see how much product is left. It has a doe foot applicator which can be used to dab the concealer directly on the area of concern. I apply this concealer by directly dabbing the applicator on the area I want to lighten. Then I pat and blend using my clean fingers. To avoid contamination of the applicator, make sure your face is clean prior to application, don't use the applicator for any other purpose, and always replace the cap after use. Here's what it looks like on me. As you can see, it gives a dewy finish when blended. Just set it with powder after application. To close this post, here's a summary of what I like and what I don't like about this product. Price and availability - the two good things about local products. This 6-ml tube of concealer costs 80 Php and it is available in most supermarkets and drugstores. The smell. I'm not a fan of the smell of tea tree oil but that's just me. But the smell is starting to grow on me now. i had one when i was in high school. didnt work for me though. Why would you want to put something on your face that smells bad? Ew. @Bonnie, it doesn't actually smell bad. I just don't like how it smells. But that's just me. And the smell goes away quickly so it's ok. Some people like the smell of tea tree oil. You can try The Body Shop's similar product range. Or you can buy pure tea tree oil from The Body Shop (way overpriced) or from drug stores (at a more reasonable fare). The best way is to use hypoallergenic and noncomedogenic products so you won't really need to conceal anything. Go natural! Just bought this today and looked for reviews to check if what I got is a dud. Light coverage pala talaga sya. Yung sakin parang tinted moisturizer lang.